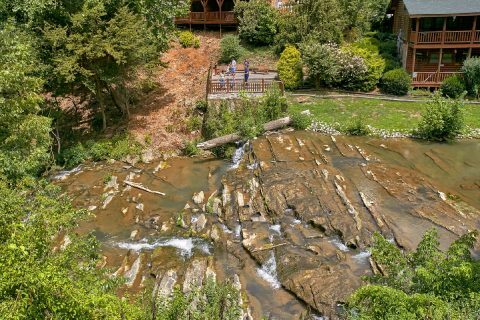 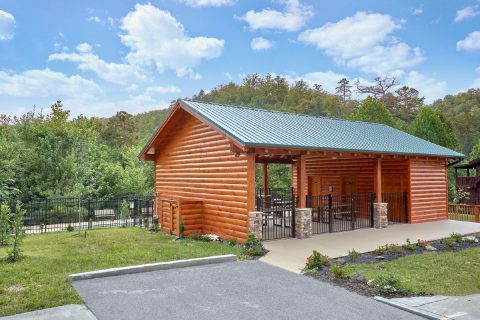 Come to Pigeon Forge, TN to experience "Creekside Hideaway!" 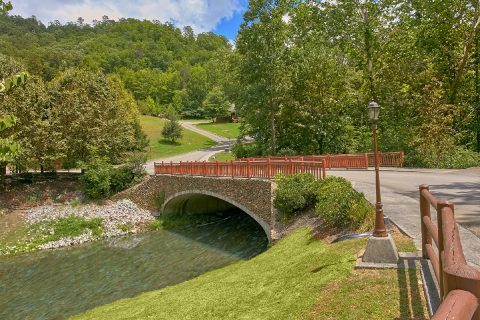 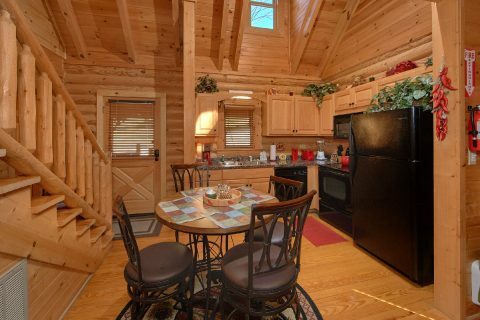 This romantic, 2-bedroom cabin on a creek rests in a gorgeous resort area only 5 miles away from the thrilling Pigeon Forge Parkway! 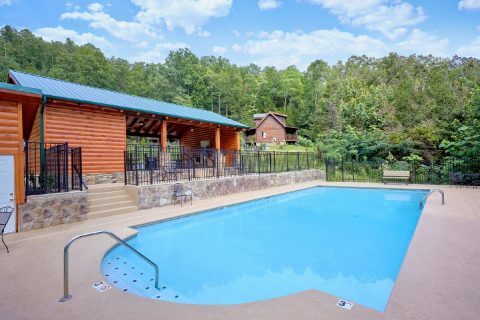 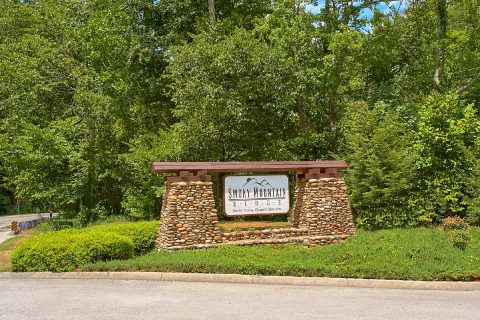 Thanks to this honeymoon cabin's prime location just off of Wears Valley road, guests can easily reach popular attractions like the Titanic Museum, Dixie Stampede, and Dollywood! 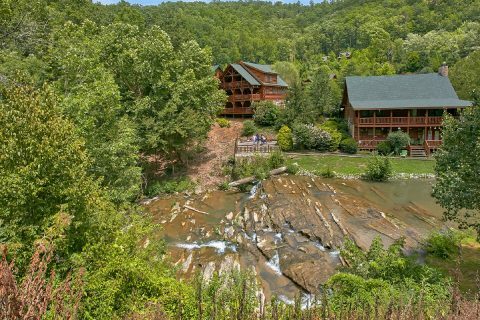 "Creekside Hideaway" is a great rental for couples on honeymoons or anniversary trips, but can accommodate a small group of up to 7 guests. 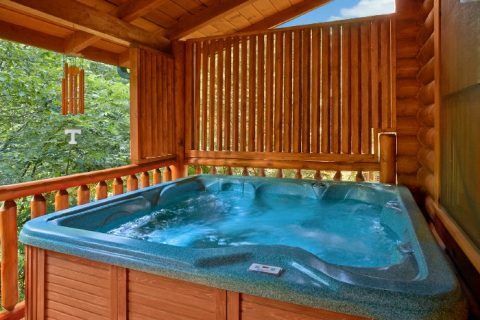 Better yet, this honeymoon cabin comes complete with outdoor swimming pool access courtesy of Smoky Mountain Ridge Resort! 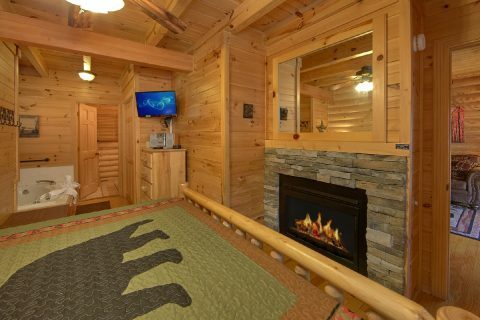 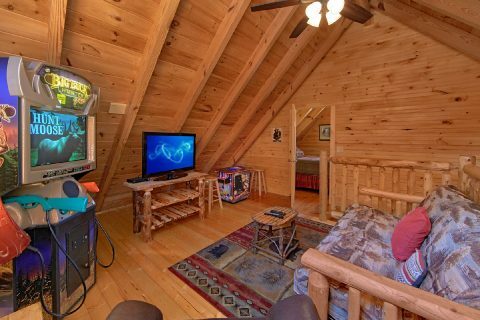 As soon as you enter into the main level of this luxury cabin, you'll be glad you booked a quality rental in the Smokies. 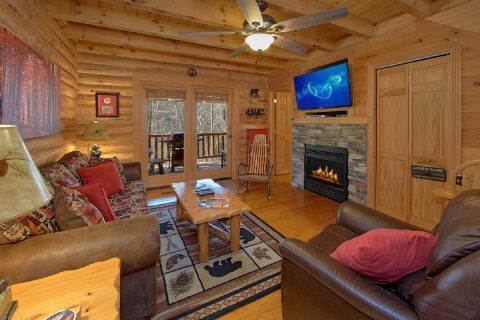 The living area features high ceilings, a stacked-stone gas fireplace, a flat screen television, and comfortable furnishings for unwinding. 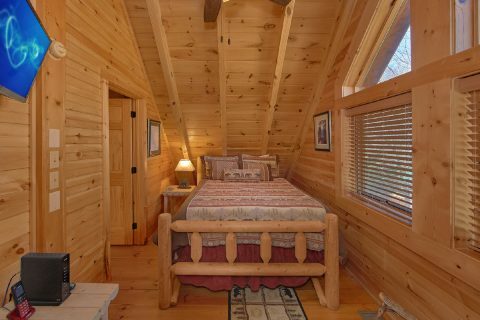 This room is home to a queen sleeper sofa that provides extra sleeping space for guests. 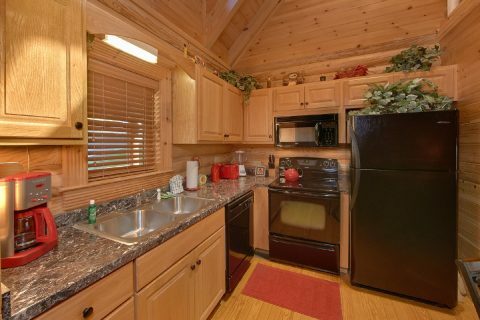 Nearby, you'll find your cabin's full kitchen and dining area with seating for 4 guests. 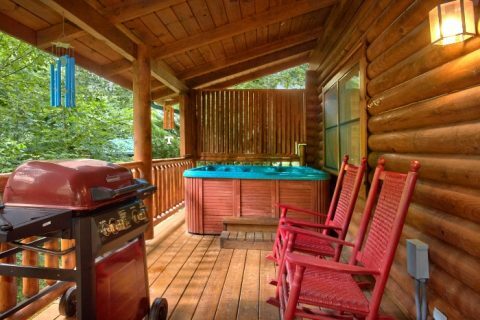 Enjoy romantic dinners near the gas fireplace or step outside to the back porch to dine at the picnic table. 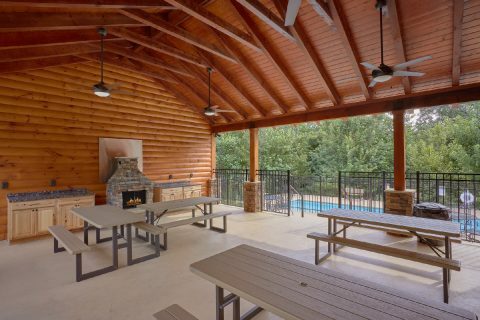 From the main level, you can step out onto a covered back deck that comes complete with your cabin's hot tub, rocking chairs, and a gas grill that's perfect for a summer cookout or a romantic steak dinner. 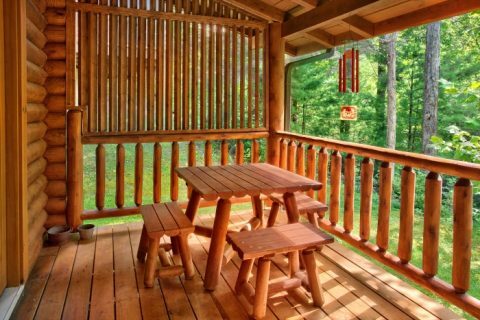 From the back deck, you can hear the soothing sounds of moving water and chirping birds that can help you relax with someone truly special. 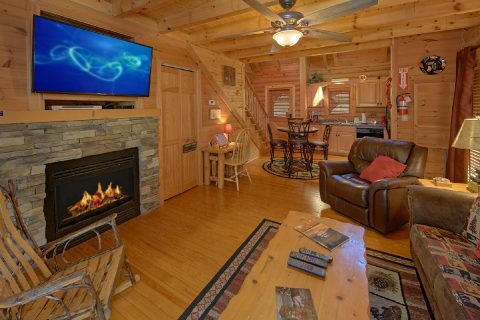 Near the living room, you'll find the romantic master suite that shares the double-sided fireplace with the living room. 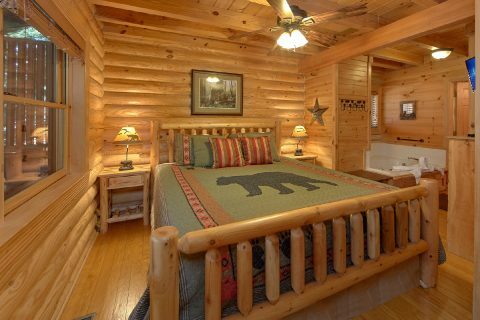 This room provides a king-size bed, private jacuzzi tub, and a full bathroom. 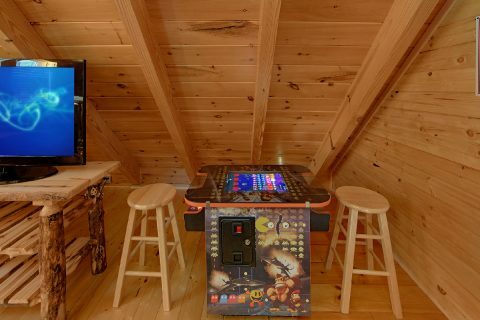 Upstairs, you'll have a great time in the lofted game area with two arcade games and a flat screen television. 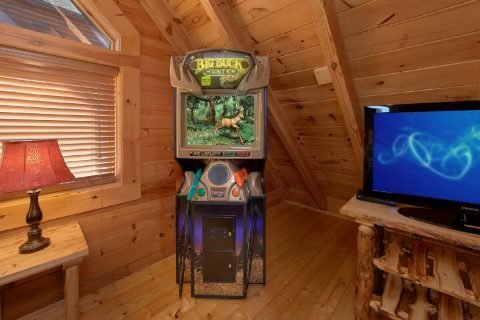 One standup arcade game is a shooting/hunting game while the other sit-down arcade game features dozens of classic games to explore. 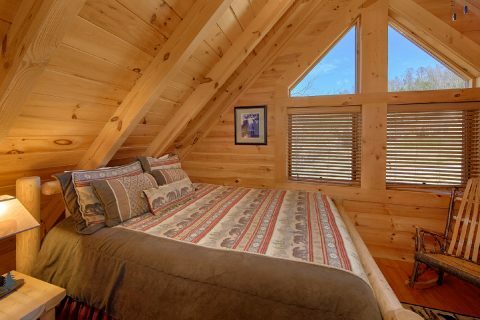 For extra sleeping space, this level features a queen-size futon and a queen-size bedroom. 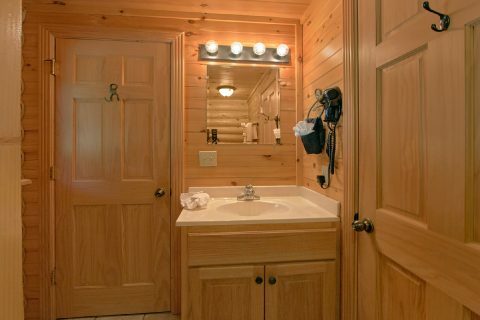 This level also features a half-bathroom. 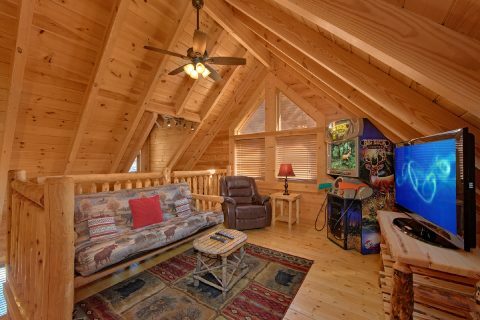 During your stay, you'll appreciate this cabin's WiFi Internet access and washer/dryer that allow you pack light on your vacation. 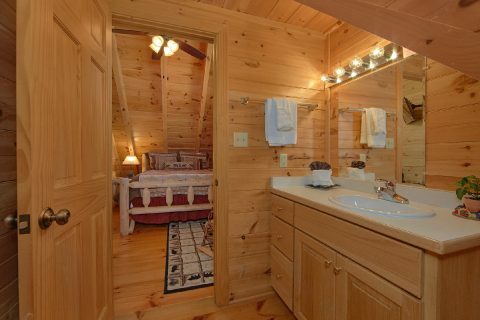 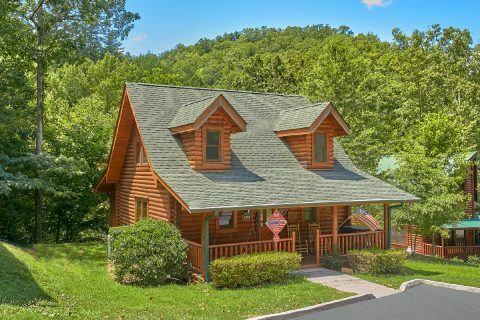 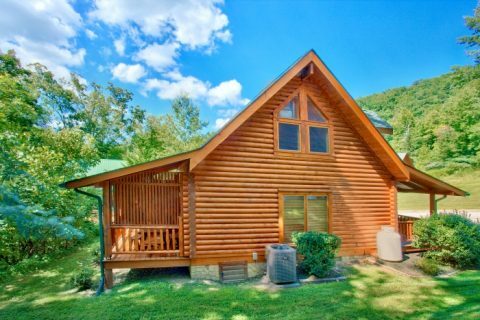 If this cabin isn't large enough for your vacation needs, Cabins USA offers several other nearby cabins that can be booked together for an especially luxurious stay in the Smoky Mountains! 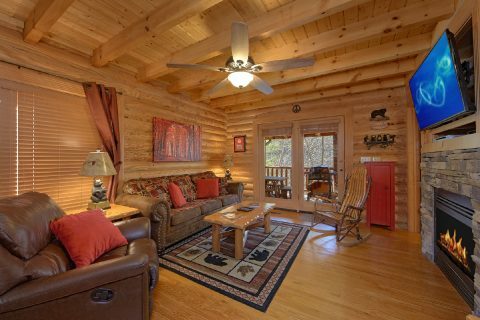 Simply contact our reservations office about reserving multiple cabin rentals for your getaway. 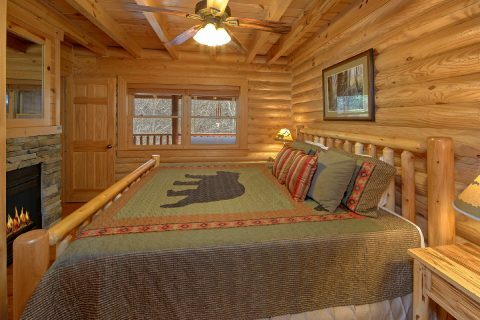 Make timeless memories on your Pigeon Forge honeymoon by booking "Creekside Hideaway" with Cabins USA! 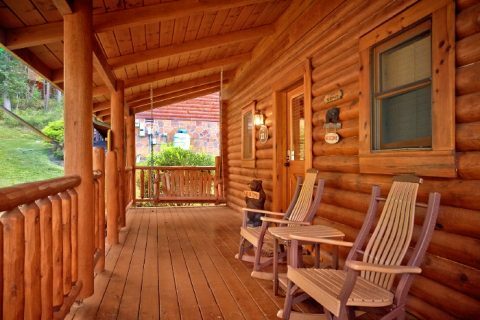 Guests of this cabin will earn a 15% discount on your stay! 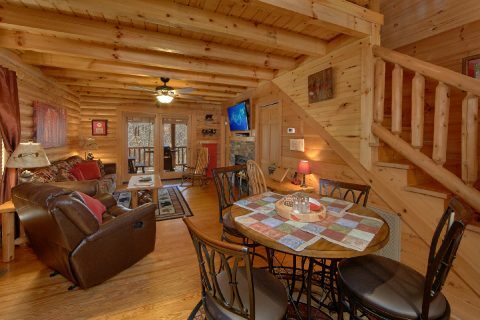 Simply check this rental's availability to see how much you can save on your romantic cabin vacation in the Smokies!